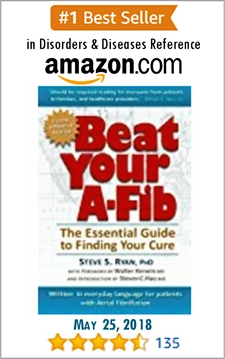 Realize there are others who have been through A-Fib. Find them, use them as part of your A-Fib support system. 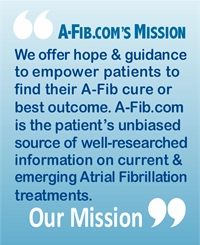 Online support groups can be very helpful to patients and others interested in A-Fib. 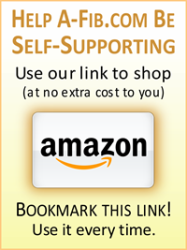 It’s helpful to know you are not alone. Many, many others are dealing with Atrial Fibrillation. These groups are free, but usually require registration before you can post messages or even read the messages. All are good for posting messages and searching for responses. But each is unique. Membership numbers vary greatly. 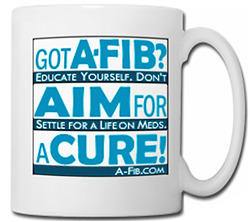 For a list of A-Fib Online Discussion Groups and Message Boards, go to Resources and Links. Warning: Guard your privacy! 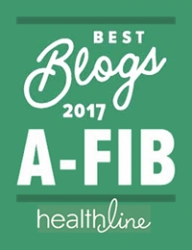 If you join any of the online A-Fib Discussion Groups or Forums. you may want to not use your real name, address, etc. Because insurance companies, employers, mortgage lenders, credit card companies, etc. may put your name into a search engine, e.g. ‘Google’. 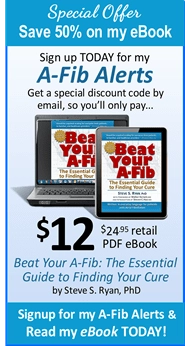 They may find you belong to an Atrial Fibrillation discussion site, forum, or that you have Atrial Fibrillation. This information may be used against you or may influence their decision-making about you.